Dr. Farmakiotis is the Director of Transplant and Oncology Infectious Diseases (ID) at Rhode Island Hospital, the Lifespan Cancer Center and Cardiovascular Institute (heart transplant and VAD ID clinic). He also attends on the teaching general ID service. Dr. Farmakiotis graduated valedictorian from the Aristotle University of Thessaloniki, Greece, and trained in Internal Medicine at Albert Einstein College of Medicine/Jacobi Medical Center in the Bronx, NY. 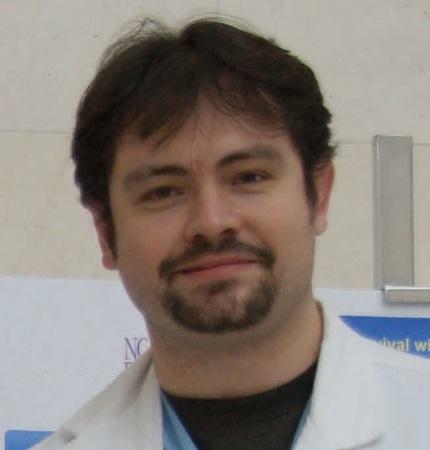 He completed his ID fellowship at Baylor College of Medicine on the MD Anderson Immunocompromised Host Track, in Houston, TX, and served as Chief Fellow for Baylor ID, followed by one year of advanced training in Transplant-Oncology ID at Brigham and Women's Hospital and the Dana-Farber Cancer Institute of Harvard Medical School. Dr. Farmakiotis' clinical and research interests focus on common and opportunistic infections in immunocompromised patients, particularly invasive fungal infections, mechanisms and clinical significance of resistance to antifungals in Candida species, antifungal stewardship, VAD infections, CMV, HIV and hepatitis-C.
Farmakiotis, Dimitrios, Le, Audrey, Weiss, Zoe, Ismail, Nour, Kubiak, David W., Koo, Sophia False Positive Bronchoalveolar Lavage Galactomannan: Effect of host and cut-off value.. Mycoses/Mycoses. 2019; 62 (3) : 204-213. Serpa JA, Knights S, Farmakiotis D, Campbell J Brucellosis in Adults and Children: A 10-Year Case Series at Two Large Academic Hospitals in Houston, Texas.. Southern medical journal. 2018; 111 (6) : 324-327. Kitmiridou, Despoina, Aung, Su N., Farmakiotis, Dimitrios Disseminated Mucormycosis with Positive <i>Aspergillus</i> Galactomannan.. Case Reports in Infectious Diseases/Case Reports in Infectious Diseases. 2018; 2018 : 4294013. Fung M, Jacobsen E, Freedman A, Prestes D, Farmakiotis D, Gu X, Nguyen PL, Koo S Increased Risk of Infectious Complications in Older Patients With Indolent Non-Hodgkin Lymphoma Exposed to Bendamustine.. Clinical Infectious Diseases. 2018; 68 (2) : 247-255. Le A, Farmakiotis D, Reagan JL Pruritic Rash in a Patient with Hodgkin's Lymphoma.. Cureus/Cureus. 2018; 10 (4) : e2450. Weiss Z, Mehta N, Aung SN, Migliori M, Farmakiotis D Rapid Reversal of Complete Binocular Blindness With High-Dose Corticosteroids and Lumbar Drain in a Solid Organ Transplant Recipient With Cryptococcal Meningitis and Immune Reconstitution Syndrome: First Case Study and Literature Review.. Open forum infectious diseases. 2018; 5 (2) : ofy007. Le, Audrey, Chung, Maggie, Pisharodi, Latha, Reagan, John L, Farmakiotis, Dimitrios Dysuria in a Patient With AIDS and Lymphoma. Clinical Infectious Diseases/Clinical Infectious Diseases. 2017; 65 (5) : 868-869. Stone JA, Knoll BM, Farmakiotis D Relapsing EBV encephalitis in a renal transplant recipient.. IDCases. 2017; 10 : 83-87. Black RC Jr, Reagan J, Taliano R, Farmakiotis D Rhomboid glossitis in disseminated CMV infection.. IDCases. 2017; 8 : 42-44. Farmakiotis D, Liakos A, Miller MB, Krane JF, Baden LR, Hammond SP An Avid Imitator.. Journal of clinical medicine research. 2016; 8 (3) : 257-9. Tan X, Chen R, Zhu S, Wang H, Yan D, Zhang X, Farmakiotis D, Mylonakis E Candida albicans Airway Colonization Facilitates Subsequent Acinetobacter baumannii Pneumonia in a Rat Model.. Antimicrobial Agents and Chemotherapy. 2016; 60 (6) : 3348-54. Tan X, Zhu S, Yan D, Chen W, Chen R, Zou J, Yan J, Zhang X, Farmakiotis D, Mylonakis E Candida spp. airway colonization: A potential risk factor for Acinetobacter baumannii ventilator-associated pneumonia.. Med Mycol. 2016; 54 (6) : 557-66. Farmakiotis D, Zeluff B IMAGES IN CLINICAL MEDICINE. Metronidazole-Associated Encephalopathy.. New England Journal of Medicine. 2016; 374 (15) : 1465. Farmakiotis D, Kontoyiannis DP Mucormycoses.. Infectious disease clinics of North America. 2016; 30 (1) : 143-63. Healey KR, Zhao Y, Perez WB, Lockhart SR, Sobel JD, Farmakiotis D, Kontoyiannis DP, Sanglard D, Taj-Aldeen SJ, Alexander BD, Jimenez-Ortigosa C, Shor E, Perlin DS Prevalent mutator genotype identified in fungal pathogen Candida glabrata promotes multi-drug resistance.. Nature Communications. 2016; 7 : 11128. Stempel JM, Farmakiotis D, Tarrand JJ, Kontoyiannis DP Time-to-reporting of blood culture positivity and central venous catheter-associated Candida glabrata fungemia in cancer patients.. Diagnostic microbiology and infectious disease. 2016; 85 (3) : 391-3. Alevizakos M, Farmakiotis D, Mylonakis E Updated practice guidelines for the diagnosis and management of aspergillosis: challenges and opportunities.. Journal of thoracic disease. 2016; 8 (12) : E1767-E1770. Kubiak DW, Farmakiotis D, Arons V, Hollins RM, Rostas SE, Weiser LM, Baden LR, Marty FM, Koo S Utility of in-house fluconazole disk diffusion susceptibility testing in the treatment of candidemia.. Diagnostic microbiology and infectious disease. 2016; 84 (3) : 223-6. Farmakiotis D, Kyvernitakis A, Tarrand JJ, Kontoyiannis DP Early initiation of appropriate treatment is associated with increased survival in cancer patients with Candida glabrata fungaemia: a potential benefit from infectious disease consultation.. Clinical microbiology and infection : the official publication of the European Society of Clinical Microbiology and Infectious Diseases. 2015; 21 (1) : 79-86. Farmakiotis D, Kontoyiannis DP Emerging issues with diagnosis and management of fungal infections in solid organ transplant recipients.. American journal of transplantation : official journal of the American Society of Transplantation and the American Society of Transplant Surgeons. 2015; 15 (5) : 1141-7. Wang E, Farmakiotis D, Yang D, McCue DA, Kantarjian HM, Kontoyiannis DP, Mathisen MS The ever-evolving landscape of candidaemia in patients with acute leukaemia: non-susceptibility to caspofungin and multidrug resistance are associated with increased mortality.. Journal of Antimicrobial Chemotherapy. 2015; 70 (8) : 2362-8. Jung DS, Farmakiotis D, Jiang Y, Tarrand JJ, Kontoyiannis DP Uncommon Candida Species Fungemia among Cancer Patients, Houston, Texas, USA.. Emerging infectious diseases. 2015; 21 (11) : 1942-50. Farmakiotis D, Ntouloulis C, Mihailidis N, Theofilogiannakos EK, Makavos G, Bakas A, Vassiliadou E Diagnostic value of eosinopenia in non-Typhi Salmonella enteritis.. Clinical Infectious Diseases. 2014; 59 (8) : 1197-8. Shirazi F, Farmakiotis D, Yan Y, Albert N, Do KA, Kontoyiannis DP Diet modification and metformin have a beneficial effect in a fly model of obesity and mucormycosis.. PLoS ONE. 2014; 9 (9) : e108635. Farmakiotis D, Tarrand JJ, Kontoyiannis DP Drug-resistant Candida glabrata infection in cancer patients.. Emerging infectious diseases. 2014; 20 (11) : 1833-40. Farmakiotis D, Tarrand JJ, Kontoyiannis DP Efficacy and tolerability of micafungin monotherapy for candidemia and deep-seated candidiasis in adults with cancer.. Antimicrobial Agents and Chemotherapy. 2014; 58 (6) : 3526-9. Farmakiotis D, Shirazi F, Zhao Y, Saad PJ, Albert ND, Roilides E, Walsh TJ, Perlin DS, Kontoyiannis DP Methylprednisolone enhances the growth of Exserohilum rostratum in vitro, attenuates spontaneous apoptosis, and increases mortality rates in immunocompetent Drosophila flies.. Journal of Infectious Diseases. 2014; 210 (9) : 1471-5. Chien KS, Farmakiotis D, Rodriguez-Barradas MC, Musher DM It's not that simple.. Clinical Infectious Diseases. 2013; 56 (2) : 308. Farmakiotis D Obesity and serious infections.. Annals of Internal Medicine. 2013; 159 (12) : 859. Farmakiotis D, Chien KS, Shum TC, Rodriguez-Barradas M, Musher DM Photo quiz. To scan or not to scan?. Clinical Infectious Diseases. 2013; 56 (7) : 1003, 1052-3. Farmakiotis D, Ciurea AM, Cahuayme-Zuniga L, Kontoyiannis DP The diagnostic yield of skin biopsy in patients with leukemia and suspected infection.. The Journal of infection. 2013; 67 (4) : 265-72. Farmakiotis D, Tverdek FP, Kontoyiannis DP The safety of amphotericin B lipid complex in patients with prior severe intolerance to liposomal amphotericin B.. Clinical Infectious Diseases. 2013; 56 (5) : 701-3. Farmakiotis D, Varughese J, Sue P, Andrews P, Brimmage M, Dobroszycki J, Coyle CM Typhoid Fever in an inner city hospital: a 5-year retrospective review.. Journal of travel medicine. 2013; 20 (1) : 17-21. Cardenas-Garcia J, Farmakiotis D, Baldovino BP, Kim P Wegener's granulomatosis in a middle-aged woman presenting with dyspnea, rash, hemoptysis and recurrent eye complaints: a case report.. Journal of medical case reports. 2012; 6 : 335. Sanchez JM, Tan JA, Farmakiotis D, Aggarwal V Atypical Strokes in a Young African American Male: A Case of Mitochondrial Encephalopathy Lactic Acidosis and Stroke-Like Episodes (MELAS) Syndrome.. Stroke research and treatment. 2011; 2011 : 140630. Cabrera VJ, Farmakiotis D, Aggarwal V Methylene chloride intoxication treated with hyperbaric oxygen therapy.. The American Journal of Medicine. 2011; 124 (5) : e3-4. Toulis KA, Goulis DG, Farmakiotis D, Georgopoulos NA, Katsikis I, Tarlatzis BC, Papadimas I, Panidis D Adiponectin levels in women with polycystic ovary syndrome: a systematic review and a meta-analysis.. Human reproduction update. 2009; 15 (3) : 297-307. Karkanaki A, Piouka A, Katsikis I, Farmakiotis D, Macut D, Panidis D Adiponectin levels reflect the different phenotypes of polycystic ovary syndrome: study in normal weight, normoinsulinemic patients.. Fertility and sterility. 2009; 92 (6) : 2078-81. Piouka A, Farmakiotis D, Katsikis I, Macut D, Gerou S, Panidis D Anti-Mullerian hormone levels reflect severity of PCOS but are negatively influenced by obesity: relationship with increased luteinizing hormone levels.. AJP: Endocrinology and Metabolism. 2009; 296 (2) : E238-43. Pachiadakis I, Chokshi S, Cooksley H, Farmakiotis D, Sarrazin C, Zeuzem S, Michalak TI, Naoumov NV Early viraemia clearance during antiviral therapy of chronic hepatitis C improves dendritic cell functions.. Clinical Immunology. 2009; 131 (3) : 415-25. Bairactaris C, Demakopoulos N, Tripsianis G, Sioka C, Farmakiotis D, Vadikolias K, Heliopoulos I, Georgoulias P, Tsougos I, Papanastasiou I, Piperidou C Impact of dopamine transporter single photon emission computed tomography imaging using I-123 ioflupane on diagnoses of patients with parkinsonian syndromes.. Journal of Clinical Neuroscience. 2009; 16 (2) : 246-52. Topalidou M, Effraimidou S, Farmakiotis D, Papadakis E, Papaioannou G, Korantzis I, Garipidou V Low protein Z levels, but not the intron F G79A polymorphism, are associated with unexplained pregnancy loss.. Thrombosis research. 2009; 124 (1) : 24-7. Effraimidou S, Farmakiotis D, Topalidou M Protein Z levels and recurrent pregnancy loss.. Fertility and sterility. 2009; 91 (5) : e27; author reply e28. Tsourdi E, Kourtis A, Farmakiotis D, Katsikis I, Salmas M, Panidis D The effect of selective estrogen receptor modulator administration on the hypothalamic-pituitary-testicular axis in men with idiopathic oligozoospermia.. Fertility and sterility. 2009; 91 (4 Suppl) : 1427-30. Delaroudis SP, Efstathiadou ZA, Koukoulis GN, Kita MD, Farmakiotis D, Dara OG, Goulis DG, Makedou A, Makris P, Slavakis A, Avramides AI Amelioration of cardiovascular risk factors with partial biochemical control of acromegaly.. Clinical endocrinology. 2008; 69 (2) : 279-84. Panidis D, Farmakiotis D, Rousso D, Kourtis A, Katsikis I, Krassas G Obesity, weight loss, and the polycystic ovary syndrome: effect of treatment with diet and orlistat for 24 weeks on insulin resistance and androgen levels.. Fertility and sterility. 2008; 89 (4) : 899-906. Panidis D, Farmakiotis D, Rousso D, Katsikis I, Delkos D, Piouka A, Gerou S, Diamanti-Kandarakis E Plasma visfatin levels in normal weight women with polycystic ovary syndrome.. European journal of internal medicine. 2008; 19 (6) : 406-12. Charitidou C, Farmakiotis D, Zournatzi V, Pidonia I, Pegiou T, Karamanis N, Hatzistilianou M, Katsikis I, Panidis D The administration of estrogens, combined with anti-androgens, has beneficial effects on the hormonal features and asymmetric dimethyl-arginine levels, in women with the polycystic ovary syndrome.. Atherosclerosis. 2008; 196 (2) : 958-65. Farmakiotis D, Katsikis I, Panidis D Calcium homeostasis and anovulatory infertility.. Human reproduction (Oxford, England). 2007; 22 (12) : 3264; author reply 3265. Stogianni A, Nikolopoulos P, Oikonomou I, Gatzola M, Balaris V, Farmakiotis D, Dimitriadis A Childhood acute pyelonephritis: comparison of power Doppler sonography and Tc-DMSA scintigraphy.. Pediatr Radiol. 2007; 37 (7) : 685-90. Stylianou C, Galli-Tsinopoulou A, Farmakiotis D, Rousso I, Karamouzis M, Koliakos G, Nousia-Arvanitakis S Ghrelin and leptin levels in obese adolescents. Relationship with body fat and insulin resistance.. Hormones (Athens, Greece). 2007; 6 (4) : 295-303. Galli-Tsinopoulou A, Stylianou C, Farmakiotis D, Rousso I, Karamouzis M, Nousia-Arvanitakis S Ghrelin serum levels during oral glucose tolerance test in prepubertal obese children with insulin resistance.. Journal of pediatric endocrinology &amp; metabolism : JPEM. 2007; 20 (10) : 1085-92. Farmakiotis D, Farmakis C, Rousso D, Kourtis A, Katsikis I, Panidis D The beneficial effects of toremifene administration on the hypothalamic-pituitary-testicular axis and sperm parameters in men with idiopathic oligozoospermia.. Fertility and sterility. 2007; 88 (4) : 847-53. Panidis D, Farmakiotis D Treatment of infertility in the polycystic ovary syndrome.. New England Journal of Medicine. 2007; 356 (19) : 1999; author reply 2000-1. Katsikis I, Rousso D, Farmakiotis D, Kourtis A, Diamanti-Kandarakis E, Zournatzi-Koiou V, Panidis D Creatine phosphokinase in ectopic pregnancy revisited: significant diagnostic value of its MB and MM isoenzyme fractions.. American Journal of Obstetrics and Gynecology. 2006; 194 (1) : 86-91. Galanis N, Farmakiotis D, Kouraki K, Fachadidou A Forced expiratory volume in one second and peak expiratory flow rate values in non-professional male tennis players.. The Journal of sports medicine and physical fitness. 2006; 46 (1) : 128-31. Panidis D, Macut D, Farmakiotis D, Rousso D, Kourtis A, Katsikis I, Spanos N, Petakov M, Bjekic J, Damjanovic S Indices of insulin sensitivity, beta cell function and serum proinsulin levels in the polycystic ovary syndrome.. European Journal of Obstetrics & Gynecology and Reproductive Biology. 2006; 127 (1) : 99-105. Panidis D, Rousso D, Koliakos G, Kourtis A, Katsikis I, Farmakiotis D, Votsi E, Diamanti-Kandarakis E Plasma metastin levels are negatively correlated with insulin resistance and free androgens in women with polycystic ovary syndrome.. Fertility and sterility. 2006; 85 (6) : 1778-83. Katsikis I, Rousso D, Farmakiotis D, Kourtis A, Diamanti-Kandarakis E, Panidis D Receiver operator characteristics and diagnostic value of progesterone and CA-125 in the prediction of ectopic and abortive intrauterine gestations.. European Journal of Obstetrics & Gynecology and Reproductive Biology. 2006; 125 (2) : 226-32. Panidis D, Farmakiotis D, Koliakos G, Rousso D, Kourtis A, Katsikis I, Asteriadis C, Karayannis V, Diamanti-Kandarakis E Comparative study of plasma ghrelin levels in women with polycystic ovary syndrome, in hyperandrogenic women and in normal controls.. Human reproduction (Oxford, England). 2005; 20 (8) : 2127-32. Panidis D, Farmakiotis D, Rousso D, Koliakos G, Kaltsas T, Krassas G Decrease in adiponectin levels in women with polycystic ovary syndrome after an oral glucose tolerance test.. Fertility and sterility. 2005; 83 (1) : 232-4. Panidis D, Farmakiotis D, Rousso D, Katsikis I, Kourtis A, Diamanti-Kandarakis E Serum luteinizing hormone levels are markedly increased and significantly correlated with Delta 4-androstenedione levels in lean women with polycystic ovary syndrome.. Fertility and sterility. 2005; 84 (2) : 538-40. Panidis D, Balaris C, Farmakiotis D, Rousso D, Kourtis A, Balaris V, Katsikis I, Zournatzi V, Diamanti-Kandarakis E Serum parathyroid hormone concentrations are increased in women with polycystic ovary syndrome.. Clinical Chemistry. 2005; 51 (9) : 1691-7. Panidis D, Kourtis A, Kukuvitis A, Farmakiotis D, Xita N, Georgiou I, Tsatsoulis A Association of the T45G polymorphism in exon 2 of the adiponectin gene with polycystic ovary syndrome: role of Delta4-androstenedione.. Human reproduction (Oxford, England). 2004; 19 (8) : 1728-33. Panidis D, Farmakiotis D, Kourtis A, Rousso D Resistin as a local factor in polycystic ovary syndrome: a novel view of "adipo(cyto)kines"?. Human reproduction (Oxford, England). 2004; 19 (7) : 1681. Panidis D, Koliakos G, Kourtis A, Farmakiotis D, Mouslech T, Rousso D Serum resistin levels in women with polycystic ovary syndrome.. Fertility and sterility. 2004; 81 (2) : 361-6. Panidis D, Kourtis A, Farmakiotis D, Mouslech T, Rousso D, Koliakos G Serum adiponectin levels in women with polycystic ovary syndrome.. Human reproduction (Oxford, England). 2003; 18 (9) : 1790-6. Kintsurashvili E, Duka I, Gavras I, Johns C, Farmakiotis D, Gavras H Effects of ANG II on bradykinin receptor gene expression in cardiomyocytes and vascular smooth muscle cells.. American Journal of Physiology - Heart and Circulatory Physiology. 2001; 281 (4) : H1778-83. Dr. Farmakiotis' research interests focus on infectious complications of chemotherapy and transplantation, common and opportunistic infections in non-HIV immunocompromised patients, and more specifically invasive fungal infections in non-HIV immunocompromised patients, mechanisms and clinical significance of resistance to antifungals in Candida species, multi-drug resistance in Candida glabrata, antifungal stewardship, CMV, particularly the use of cellular immunity assays, and hepatitis-C in oncology and solid organ transplantation. The study of viral, bacterial and fungal infections in immunocompromised individuals, such as those with cancer, hematologic malignancies or solid organ transplant recipients, is challenging. Unfortunately, the relatively new subspecialty of transplant - oncology ID has been historically hampered by empiricism and poorly-supported data from retrospective studies and small case-series. The stakes for the community are high, because of (i) the substantial investments in cancer care, solid organ, or hematopoetic stem cell transplantation and (ii) the significance of appropriate organ allocation and favorable outcomes in transplantation, given the increasing demand with relatively small and stable donor pools. In these patient populations, we and others have shown that early initiation of antifungal treatment can be life-saving, causing a marked increase in the use of antifungals over the last few years, and, consequently, the development of resistance among Candida species. The molecular basis of resistance to multiple antifungal drugs and its effect on the virulence of Candida clinical isolates are largely unknown. Such information could enable rational and precise antifungal stewardship, help in the development of novel antifungal agents and optimise management of invasive fungal infections. To this end, I aim to provide critical insight into mechanisms of antifungal resistance, help develop and study new antifungal drugs, and accelerate my career as a leader in the structured study of life-threatening infections in immunocompromised hosts. The goal of this multi-institutional registry is to capture the baseline characteristics and clinical course of patients treated with the new triazoles voriconazole, posaconazole and isavuconazole. Using a commercially available assay measuring cytomegalovirus (CMV)-specific CD4+ and CD8+ T-cell immunity by intracellular cytokine staining to monitor cellular immunity and predict protection against CMV. Funded by Viracor-Eurofins. The goal of this investigator-initiated, prospective, blinded study is to assess the performance of a novel, commercially available assay measuring CMV-specific cellular immunity in predicting clinically significant CMV events. The goal of this project was to study the efficacy and tolerability of monotherapy with micafungin for the treatment of candidemia and deep-seated candidiasis and identify factors associated with clinical failure and death, among patients with cancer, including those with hematologic malignancies and severe neutropenia, an understudied patient population. The goal of this pilot project is to establish the nematode C. elegans as a high throughput, inexpensive model to study MDR in C. glabrata and the efficacy of different antifungal regimens against drug-resistant C. glabrata strains. The goal of this multi-institutional registry is to the clinical course of patients infected with rare molds, specifically Aspergillus non-fumigatus species and the mucorales, with a focus on efficacy and tolerability of isavuconazole. During bedside rounds and through designated 1-hour talks, Dr. Farmakiotis teaches medical students, internal medicine and surgery residents, as well as infectious diseases and nephrology fellows about (a) fungal infections, (b) infections in non-HIV immunocompromised hosts, such as solid organ or hematopoietic transplant recipients and patients with hematologic maligancies or solid tumors receiving toxic chemotherapy, and (c) pre-transplant ID evaluation of the potential kidney donor and recipient. Dr. Farmakiotis often serves as invited speaker or panelist at Grand Rounds and Morbidity-Mortality lectures across different speciaties. Dr. Farmakiotis' main goal in medical education is to teach by example and train the next generation of medicine and infectious disease specialists. Based on real-world educational cases, he always tries to put emphasis on thought process and principles of decision-making, as opposed to listing isolated knowledge that is available through multiple educational sources, such as textbooks, journals and the internet. So far, Dr. Farmakiotis has presented over one-hundred didactic sessions to medical students, residents, fellows and faculty at Albert Einstein College of Medicine, Baylor College of Medicine, the University of Texas at Houston, Harvard Medical School and the Alpert Medical School of Brown University.